I had always followed rugby league but never really had a club, now I did. I was a Giants fan and enjoyed many a visit to watch them play. This isn’t about my memories though. I think the club and in particular two gentleman need to receive great praise for the fine work they have done and changed the fortunes of a much loved club. It had started to become an urban myth that this club affectionately known as Fartown (suburb of Huddersfield in which the began playing and still train in to this day), were not only recognised as the ‘birthplace’ of Rugby League but they had been one of its great early champions, with no major trophy wins since 1961-62. The Bradford football fire of 1985 resulted in them losing their temporary home ground and had to play back in Fartown at an 850 capacity ground. Administration hit the club in 1994 with debts estimated to have reached £500,000 the club looked doomed. Then in 1996 the club saw the beginning of a new era, Ken Davy, below took over the club as well as Huddersfield Town Football Club and the birthplaces fortunes looked up. He was a local businessman and he was passionate about his local team. Some may say too passionate. I disagree! Under Ken’s stewardship the club looked to stabilise and even when relegated from the super league in 2001 the club remained positive and retained all of its full-time staff, they headed straight back up, unbeaten I might add. Davy was able to then attract recognised coaches in Jon Kear, Tony Smith and Jon Sharp and under the tutoring of the latter the club made significant strides. They reached the Challenge Cup final in 2006 losing to St. Helen’s and reaching the play-offs in 2007 for the first time in their history. Sharp had taken the club as far as Davy felt he could and the final piece in the revolution was appointed in July 2008, the club began to climb from this point on. 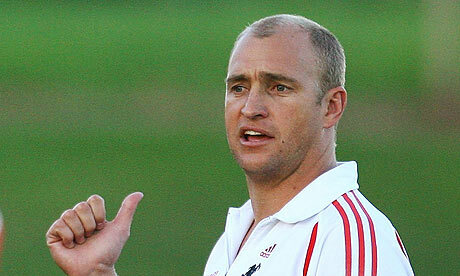 That appointment was of Nathan Brown, below, the Aussie who when he came in with the clubs fortunes went skywards. Scroll forward to the present day and Brown and Davy’s Giants sit 4th in the Super League and look destined for the play-offs despite a late defeat on Friday to St. Helen’s 12-10. But the main excitement in the town at the moment is the upcoming Challenge Cup final versus Warrington Wolves. Next Saturday (29th August) sees the Giants gunning for their first major silverware in over 45 years and I will be glued to the television watching the delightful tones of Ray French with baited breath and fingers crossed, roaring the Giants to success. The birthplace is back were it and its fans deserve them to be. Back at the top of the sport it help to found. Unsung hero’s deserve recognition and none more so than Ken Davy and the vision of coach Nathan Brown. Well done gents and keep up the great work. P.s. I must admit I think the worldwide ban handed to the now former Bath coach Den Richards isn’t harsh enough. If the problem is rife in the sport of Rubgy Union then surely a lifetime ban would have ended this disgusting cheating!